Sports have an uncanny way of breaking your heart. I just finished watching the #5 ranked Notre Dame Irish go up against the #2 and defending champion Florida State Seminoles. 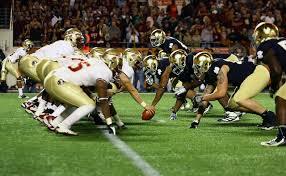 The game came down to one last drive and though the Irish fought heroically, they lost 31-27. Games like these force me to struggle with an emotional letdown. I keep telling myself, “It’s only a game. You shouldn’t feel so deflated.” But I think there must be something to this feeling of profound disappointment many of us feel when our favorite team loses the big game. I believe we are all longing for a final, climactic victory. We experience life like the big game. All that we’ve worked for comes down to one night. Our most ambitious dreams are in sight. Yet our most vicious and determined opponent stands in the way. While all the critics say we don’t stand a chance, their comments only feed our drive to win. At the end of the game all our hopes depend one play. One moment where we can prove everyone wrong, take hold of our destiny, and win the game. But we lose. We want to revel in the thrill of victory. We want the satisfaction of knowing that all of our hard work and struggle have earned the highest reward. We want the recognition that although we may have made mistakes along the way, we still had the heart to emerge as champions. Yet all too often in life our team loses. We come within a hairsbreadth of achieving everything we desire only to come up short. We don’t get the girl. We lose the job. We get the illness. We succumb to the addiction. We bury the loved one.The criminal gets acquitted. The child goes hungry. The people remain marginalized. The truth is that we were made for victory. The Bible says that of all the creatures God made, we alone are described as being made “in His image”. And we alone were given dominion, or rule, over the entire earth (Genesis 1). We are meant to be the champions of creation in imitation of the Creator. But we lost all of that when we sought victory apart from God. We forfeit our crowns when we tried to take His (Genesis 3). And yet we still bear the image of God. Although our ability to be victorious on this earth has been destroyed our desire for it has remained. Life, of course, is much more serious than a football game. But the deep, almost spiritual effects of an important sports contest arouses in us the innate sense that we’re looking for a real victory. It awakens us to the reality that there’s another kind of life we were meant to live and another kind of world in which we were meant to live it, and this isn’t it. We long to fulfill our God-given purpose of ruling the earth, yet we are powerless to make it happen. But God does not leave us in our defeat. Instead, He sends us a champion. Jesus Christ, God’s Son, is the Victor for whom we’ve been waiting. He is the ultimate underdog who, when hanging on the cross, appeared to be defeated, but when He rose from the grave He defied all odds. He is the quarterback who, when the game is on the line and the opponent seems invincible, takes the ball and carries it in for the game-winning score. We may not experience ultimate victory in this life. In fact, we certainly won’t experience the kind of final triumph that we want. But we can taste it right now. And we can be sure of it in the future when Jesus returns. Through Christ’s life, death, and resurrection He emerged victorious over the most daunting opponents of all: sin, Satan, and death itself. Now through faith in Jesus we can be on the winning team, and we can experience the joy of gaining the biggest victory of all: eternal life in perfect peace with God.